Many families cherish heirloom booties, and pass them down for several generations. Even if you don't have a pair of special baby booties that was handed down to you from previous generations, you can start your own tradition by giving a new or vintage pair of heirloom booties to the next child born into your family. There are many different styles of heirloom booties. 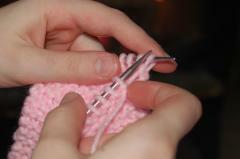 They are typically crocheted or hand-knit. Some are very ornate, and feature lace, frills, embroidery, and pearl buttons. Others are very simple and utilitarian. You can buy new or vintage baby booties, or you can make your own if you know how to knit or crochet (or are willing to learn). Many families outfit their children in heirloom booties for christenings and other special occasions. They aren't thrown away or given to a charitable organization once outgrown. Instead, they become treasured keepsakes to be saved for the next child, or the next generation of children. Some store these cherished baby booties in hope chests or otherwise put them away for safekeeping until needed for a new baby. Others choose to exhibit these special mementos where they are visible and can be enjoyed by family members and visitors. For example, individuals who collect dolls often display them on their prized collectibles. Others incorporate them into their home's décor. 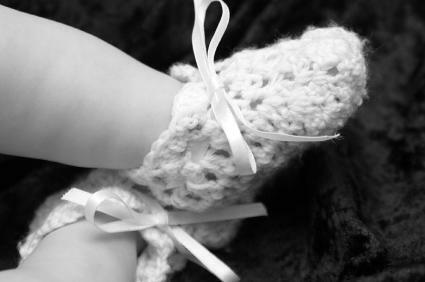 Heirloom booties can make a special baby gift for the next child born into your family. If you are ready to start an heirloom bootie tradition, your next step is to decide if you would like to purchase new booties, search for antique booties, or make your own. No matter which approach you choose, the custom of passing down a special pair of booties to new children in the family is sure to become a cherished tradition. The following retailers carry beautiful baby booties that are reproductions of vintage booties from the early 1900s, as well as more modern styles. Keep in mind that finding true antique booties may require both patience and persistence. The following retailers stock antique baby booties and other vintage clothing items as inventory becomes available. Em's Heart carries a variety of antique linens and vintage baby items. Grammie's Attic carries both vintage and new items. Check your local Yellow Pages for antique stores in your area. There really is something special about handmade heirloom items. If you don't already know how to knit or crochet, this might be a great time to pick up one or the other as a new hobby. The following retailers carry a variety of crochet and knitting patterns that can help you create vintage style booties for the infants in your life. If the idea of heirloom booties has captured your heart, you will likely enjoy the stationery and cards these retailers carry that feature heirloom baby bootie artwork. Timeless Treasure Trunk offers a baby card adorned with picture of a vintage baby bootie. Few things bring families together more than traditions and babies. Introducing heirloom booties to your family can be a powerful and long lasting way to bring the generations of your family together with special memories and keepsakes.